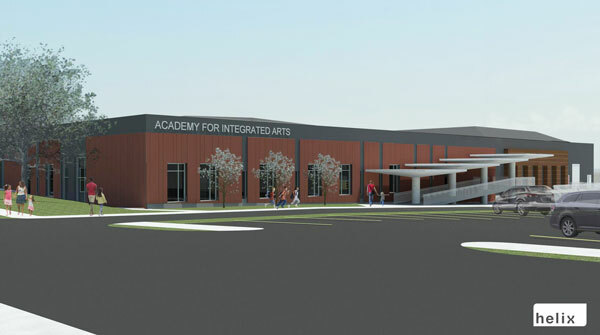 The Academy for Integrated Arts, a public charter school sponsored by the University of Missouri–Kansas City, has purchased the former King Louie East Bowling Alley at 7910 Troost. School officials said they were able to buy the site by raising more than $3 million in pledges over the past 6 months. The school will move into the new space at the beginning of the 2016-7 school year. They also said the building, constructed in 1955, is in sound shape and will allow the addition of new areas dedicated to music and fine arts. Academy for Integrated Arts was founded in 2012 and describes its program as using the arts, including music, dance and dramatization, as a catalyst for learning, achievement, curiosity and self-esteem. It currently has 120 students, and enrollment for next year is open at the school office, 5604 Troost or on its website. Enrollment is expected to grow to 160 students beginning this fall and eventually to 350 students.